Here you'll find lots of recipes and fun ideas. Click on the blog title to be transferred to the actual article, but don't forget to come back and see what's new on the website! This afternoon when I arrived at home I was greeted by the sight of a bluebird at our suet feeder. It was such a lovely confirmation that Spring has truly arrived! That, along with the fact that Easter is here in just over a week, is all the motivation I need to get ready for the annual Spring feast of Roast Leg of Lamb with assorted sides, dinner rolls, and our new Chocolate Pecan Pie for dessert.We will start our Easter morning with warm Chocolate Cherry Babka, then have the lamb for Easter dinner when we get together with the extended family.Even if you’re not a get-together-with-large-groups sort of person or family, this is a beautiful, easy meal with just a bit of prep time the night before. And, the leftovers are fantastic.Ready? Here goes… Roast Leg of Lamb with Garlic and Rosemary ¼ c honey2 T Dijon mustard2 T chopped fresh rosemary1 t freshly ground pepper1 t lemon juice¼ c balsamic vinegar¼ c EVOO6 cloves garlic, halved1 t coarse sea salt or kosher salt 1 cup water5-pound leg of lambCombine first 7 ingredients in a bowl. Rinse and pat dry the roast. Cut 12 slits around the roast and insert halved garlic cloves. Using your hands, rub the marinade all over the roast. Place it in a covered pan and refrigerate overnight.Preheat oven to 450 degrees. Place lamb on rack in roasting pan, pour water and remaining marinade into bottom of pan. (This will make a wonderful gravy with the drippings! )Place it in the oven without the lid and roast 15 minutes. Cover, reduce heat to 350 and continue cooking for about 45 more minutes, checking for doneness with an instant-read thermometer.The lamb is done (rare) when it registers 140. 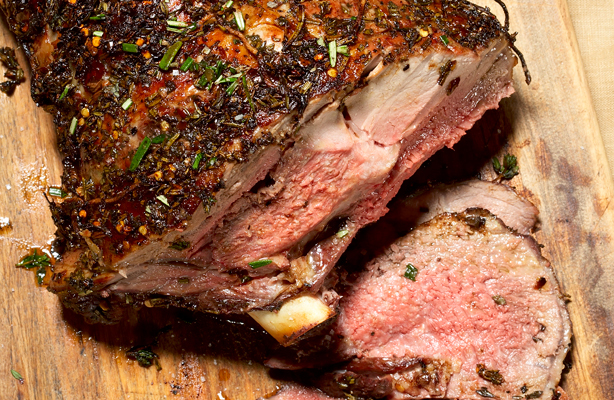 If you prefer a medium rare, let it roast until the internal temp is closer to 150.Let rest 10 minutes before carving. Every once in a while, well actually more often than that, I am at a total loss of what recipe to feature in the newsletter. So, I end up perusing my monumental stack of cookbooks. One of my favorites is a vegetarian cookbook published by Cook’s Illustrated. I’ve been gravitating toward vegetables lately and this cookbook has been a wonderful culinary adventure. The latest deliciousness is a combination of two of my favorite things – Asian food and peanut butter. Does that sound strange? Yup. But it’s great stuff. The interesting thing about peanut butter is you can add it to dishes and it gives them a robust flavor and a real protein punch. Add some ginger, soy, and garlic, and you have a “sweet, nutty, addictive flavor,” according to my recipe book and my taste buds. You’re going to love this.This recipe works because the most difficult part might be cutting up the vegetables. The sauce is so easy and is made with ingredients that you might even already have in your pantry. Sesame Noodles with Veggies Sauce5 T soy sauce¼ c chunky peanut butter3 T sesame seeds, toasted2 T rice vinegar (If you have some with garlic, I figure that is a plus since garlic is an essential part of the dish. )2 T packed light brown sugar1 T grated fresh ginger (I had some in a jar. Not as good, but passable. )2 garlic cloves (Again, I had some in a jar already minced. 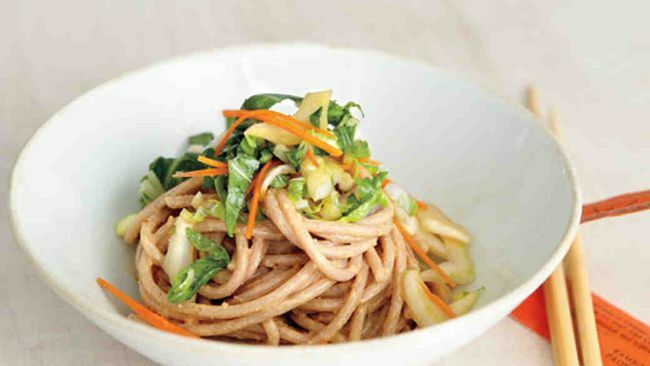 )1 t hot sauce½ c hot waterNoodles and Veggies12 ounces spaghetti or linguini2 T toasted sesame oil5 radishes, trimmed, halved, and sliced thin4 scallions, sliced thin on bias1 cucumber, peeled, halved lengthwise, seeded, and sliced thin1 carrot, peeled and grated1 c red cabbage, shredded (optional)1 T chopped fresh cilantro1 T sesame seeds, toasted For the sauce: Process all ingredients except water in blender until smooth, about 30 seconds. With blender running, add hot water, 1 T at a time, until sauce has consistency of heavy cream. (You may not need all the water). Sauce can be refrigerated up to 3 days; add warm water as needed to loosen consistency before using. For the noodles and veggies: Bring 4 quarts water to boil in large pot. Add noodles and cook, stirring often, until tender. Drain noodles, rinse with cold water and drain again, leaving noodles slightly wet. Transfer noodles to large bowl and toss with oil. Add radishes, scallions, cucumber, carrot, cilantro, and sauce and toss to combine. Sprinkle individual portions with sesame seeds and serve. 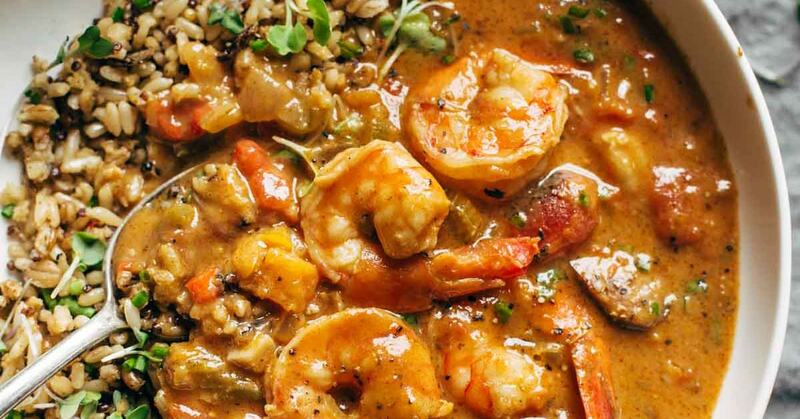 Mardi Gras Is Over, But There's Still Time For Gumbo! It’s been a busy week in Farmstead Market’s Building 2. With Tina Marie’s Chocolates moving in, we’ve been visiting with Tina and Ed in between our baking tasks. It’s going to be so fun having them in the building with us. That said, we already miss Cyndee and Kristi and will be visiting them often in the other building. Make sure you wander through both newly-renovated spaces when you come in this week!And, that’s not all that’s going on…we have great news! You did it!!! You got us into the Simply The Best contest by Harrisburg Magazine. We will be competing for the Best Bakery in Central PA in April. I’ll keep you posted on when it’s time to vote. Remember, you’ll be able to vote once a day. It would be so cool to get this recognition. Thank you all for your efforts to get us into the contest!Now, back to speaking of renovations…Many of you have observed the road signs indicating the closure of Rt. 743 from 3/11 – 3/29. (I know. We’re not very happy about it either.) The best way to get here will be to either take Rt. 39 to Rt. 22 and come in from there (Turn right at Ciocca Honda, then right again onto 743.) or, take Gravel Hill Rd. out to Rt. 22 (Turn left onto 22, then left again onto 743). I hope this helps. It’s only for a couple of weeks, then we’ll be back to normal.Well, that’s enough business. Now for this week’s recipe – Louisiana Gumbo. This is one that’s not going to be fast, but it will be SOOO worth it. It’s a mildly spicy dish best served with a loaf (or two) of our Country French bread. The trick here is to get the roux right. You must take the time to brown it to a nice rich color or the gumbo won’t have that deep, complex flavor that makes it so tummy-warming and amazing. This recipe makes a lot, so you’ll have plenty of leftovers and some to freeze. If you’re not into leftovers, better cut it in half. Louisiana Gumbo 1 T EVOO2 c skinless, boneless chicken thighs, chopped (about 3 good-sized thighs)1 pound Andouille sausage, sliced1 c butter1 c all-purpose flour4 cloves garlic, minced2 quarts chicken broth (Better Than Bouillon works well for this. )1 12-oz can or bottle of beer6 stalks celery, large dice1 lg yellow onion, large dice1 c okra, chopped (Can use frozen)1 chopped fresh jalapeño2 10-oz cans diced tomatoes with green chilies2T Tony’s Creole seasoning1 pound shrimp, peeled and deveined Heat EVOO in medium skillet until shimmering. Cook sausage until browned. Remove and sauté celery, and onion in skillet until just tender. In a large, heavy Dutch oven, melt butter then stir in flour over medium heat. Continue cooking and stirring roux until it becomes brown (a little darker than peanut butter) and gives off a nutty aroma. (About 30 minutes…remember it’s all worth it!) Mix in garlic and cook about 1 minute. Gradually stir chicken broth and beer into roux. Bring to a boil and add chicken, sausage, and vegetables. Add all remaining ingredients except shrimp and okra. Reduce heat and simmer about 40 minutes, stirring periodically. Remove from heat, stir in shrimp and okra and let sit about 10-15 minutes. (Shrimp will be perfectly cooked this way, not over-cooked.) Serve over rice and accompanied with loaves of fresh Country French bread. You all know that Tom and I work together in the bakery every day, so you wouldn’t think we can surprise each other much. Au contraire!Imagine my delight when I walked into the kitchen recently to find Tom at the stove, a pot in front of him with an amazing aroma wafting from it. He looked up and grinned at me and said, “I made three-ingredient tomato soup!” He then proceeded to tell me all the (not three!) ingredients he put into the pot that was bubbling there. Smirking, I responded, “So, you ‘Tom-ified’ the recipe.”What you must understand is that Tom has, for many years, teased me about my inability to follow a recipe. I view recipes as guidelines, then I (as Tom puts it) Sandi-fy them by adding my own ingredients and changing the proportions as I see fit.Now, those of you who have used the recipes that I have published know that this is a technique that works – as long as I remember to take notes. So, after years of this teasing, it was wonderful to have the chance to give him a bit of a hard time. (We have to get mileage out of these opportunities when they don’t come very often! )Back to the soup, though. It was amazing – thick, flavorful, very tomato-y. The best way to eat it is with a few of our croutons sprinkled into the bowl with freshly-grated parmesan on top of it all. We just made fresh croutons this week, so pick up a bag of them and make this soup to warm your tummy.So, without further ado… Three (Not So Much!) Ingredient Tomato Soup, ala Tom 2 28-oz cans whole tomatoes1 medium onion, diced4 cloves garlic, minced1 T Better Than Bouillon Chicken Base1 ½ c milk½ c heavy cream¼ c EVOO1 t dried thyme1 t dried basilSalt and pepper to tasteSandi’s Gourmet CroutonsFreshly-grated parmesan(optional: 3-5 slices 100% Whole Wheat bread – see note below)Add 2 T EVOO to a Dutch oven. Heat on medium high until shimmering. Add onion and sauté until translucent. Add garlic and sauté for 30 seconds. Add chicken base and stir until it is incorporated with the onions and garlic. Pour both cans of tomatoes into the pot. Mash tomatoes with potato masher. Bring to a boil, reduce to medium and cook, stirring occasionally, for about 15 minutes. (If using bread as noted below, this is when you add it and let it simmer with soup.) Add milk and cream, salt and pepper. 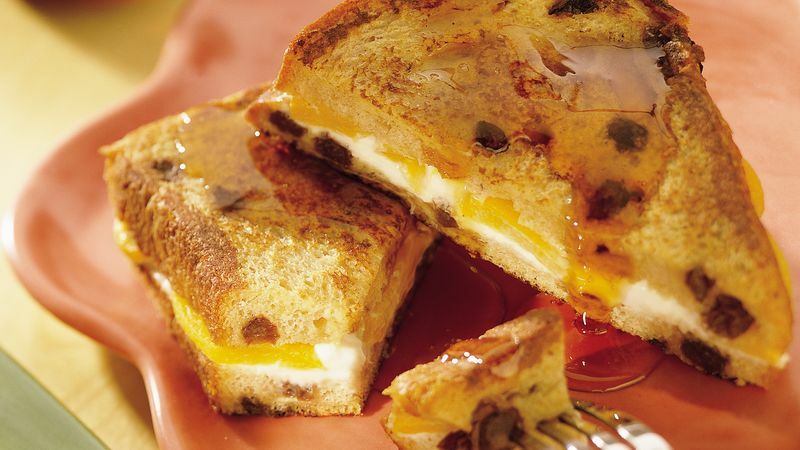 Serve immediately, drizzled with remaining EVOO, topped with croutons and freshly-grated parmesan.NOTE: You can make this recipe dairy-free by replacing the milk and cream with vegetable or chicken stock and 3-5 slices of Sandi’s 100% Whole Wheat bread. Once the tomatoes are in the pot and the soup is starting to get steamy, tear the bread up and add to the pot. Let soak while soup simmers, then process the soup with an immersion blender. The addition of the bread will add a creaminess to the texture of the soup without actually adding cream. As I sit here contemplating this week’s recipe, I realize that I haven’t really cooked this week because we were on the road, and then trying to catch up from being away. Here’s why…For those of you who don’t know, we stone mill our flours for all our breads and pastries. This means we have mill stones that must be “dressed” or “sharpened” about once a year. So, every 12-18 months, we pack up our mills and trek down to North Wilkesboro, North Carolina. It’s a great opportunity for both of us to unplug and chat about what’s going on in life and in the bakery. It’s the time when we typically brainstorm about new things we want to try. And, it’s the time we make sure to stop at other bakeries, visit with the owners, and learn from others’ experience. Essentially, it’s a learning vacation…in three days.This year, we stopped at two bakeries in Charlottesville. We ate some great naturally-leavened breads and saw some beautiful desserts. We came away with a couple of ideas that you will see on the shelves this weekend – Everything French Bread and Heart-Shaped Chocolate Cakes.As for the foods we ate, we kept it simple this time and stuck to what we know. Big salads, steak, grilled catfish, and pasta. The big salad was my favorite this time. A beautiful green salad with a steak cooked to perfection, sliced, and arranged on top. It was enough to share and it inspired me to look into making some good steaks at home. Here’s what I found… Pan Seared Steaks with Red Wine Pan Sauce Before I get to the recipe, there are a few tips we have to cover. Get the pan really hot – smoking hot – before adding the steaks. This is the only way they will get that delicious well-carmelized exterior. Pat the steaks dry and, once they’re in the pan, don’t move them until it’s time to turn them over. Let the steaks rest for 5 minutes after removing them from the pan. This will allow the juices to return to the fibers in the meat, ensuring that you have a lovely, juicy steak, rather than a well-cooked dry piece of meat. Finally, purchase the right cut of meat for your purpose. For this steak salad, the best cut will be a boneless strip steak or rib eye. Now for the recipe. Steaks 4 (8-ounce) steaks, 1 to 1 ¼ inch thick Kosher salt and pepper 1 T vegetable oilRed Wine Pan Sauce 1 shallot, minced (or a small onion, if you can’t find shallots) ¾ c chicken broth ½ c dry red wine 2 t packed brown sugar 3 T unsalted butter, cut into 3 pieces and chilled 1 t minced fresh thyme (yes, it’s worth finding it in the produce aisle..dried thyme just isn’t the same) Salt and pepper to taste Pat steaks dry with paper towels, then season with salt and pepper. Heat oil in 12-inch skillet over medium-high heat until just smoking. Add steaks and cook until browned on first side, 3-4 minutes. Flip steaks over and continue to cook until meat registers 115 to 120 degrees (for rare) or 120 to 125 degrees (for medium rare), 3-5 minutes. Transfer steaks to large plate, tent with aluminum foil, and let rest for 5 -10 minutes. Pour off all but 2 t fat from skillet. (If there isn’t that much, add some oil to equal 2 t.) Add shallot and cook over medium-high heat until softened, about 2 minutes. Stir in broth, wine, and brown sugar, scraping up any browned bits, and simmer until sauce is thickened and reduced to 1/3 cup, about 5 minutes. Stir in any accumulated meat juices. Off heat, whisk in butter, one piece at a time. Stir in thyme and season with salt and pepper. Spoon sauce over steaks and serve. 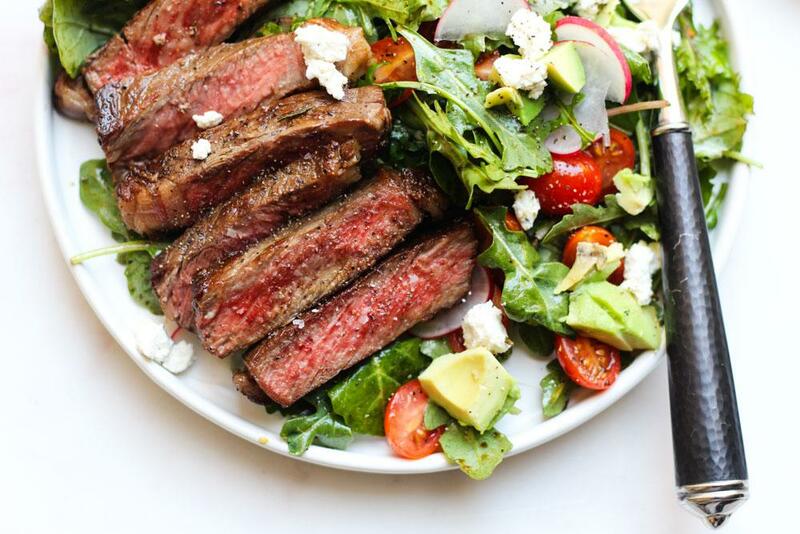 For a steak salad, I would slice the steak thin, drizzle the sauce over it, then plate on top of a pile of mixed greens with cucumbers, avocado, blue cheese crumbles, and tomatoes (maybe even a little red onion if I’m feeling adventurous). Serve with a balsamic vinaigrette and a loaf of crusty bread. Gearing Up For Bowl Game Fare - Grab Your Hot Sauce! Is anyone else feeling the weather giving them “weather whiplash”? This week’s weather has been so bizarre all I can think about is something warm and comforting for dinner. (Never mind that the Super Bowl is coming up and I have been experimenting with dips to put in our dip bowls…)So, I compromised and went with a warm dish that will suit beautifully for Super Bowl fare. (I was reminded of this dish last weekend when attending a family gathering where my sister-in-law served the yummiest meat balls on our New England Hot Dog Buns. )Before getting into the recipe, though, I just have to give a plug for a few other items that will make the buffet into an easy, over-the-top affair.Let’s start with our Boli rolls and Pepperoni Sticks that make great hors d'oeuvres. To serve, just cut the warm bolis in 4 pieces (like you would a pie), arrange on a platter with cherry tomatoes, a little celery, and some parsley for color. Have a small dish of marinara and another of Dijon mustard (we like coarse grind) on the side for dipping. The marinara will work for both the Pizza Boli rolls and the Pepperoni Sticks, while the mustard is perfect with the Ham ‘n Cheese bolis. The Pepperoni Sticks can be sliced and toasted – like Pepperoni Stick chips – or cut in quarters for a small-bites plate.Our crostinis are the perfect accompaniment for your cheese board, as well as great vehicles for hummus and spinach dip.Cheese Volcano loaves are the best accompaniment for your spicy chili or chili dip. (Heat in a 350-degree oven for 15 minutes and cut into chunks. Serve in a basket next to the chili pot. )And finally, for dessert, our brownies (warmed and served with ice cream!) are a great finish. Spicy Buffalo Meatballs 1 c sour cream¾ cup Sandi’s Breads bread crumbs (Available all the time – just ask! )1 large egg, beaten3 carrots3 stalks celery plus 1 T chopped celery leaves1 pound ground chicken (Or, if you prefer, beef. My family opts for the beef…)1 small onion, finely chopped1 T chopped fresh parsley1 clove garlic, minced¼ tsp cayenne pepperKosher salt1 T Extra Virgin Olive Oil (EVOO)1 c low sodium chicken broth¾ c Buffalo hot sauce (our favorite is Texas Pete)½ c Ketchup½ c crumbled Bleu Cheese1 8-pack Sandi’s Breads New England Style Hot Dog Buns, halved to make 16 small bunsPreheat oven to 400 degrees and lightly spray baking sheet with oil. Mix 2 T sour cream, bread crumbs and egg in large bowl; let sit 4 minutes. Grate 1 carrot and 1 celery stalk into bowl with bread crumb mix. Add meat, celery leaves, half of the onion, parsley, garlic, cayenne and ½ tsp salt and mix with hands until combined. With dampened hands, shape mixture into about 36 mini meatballs (approx 1 inch each); arrange on prepared baking sheet. Bake until browned and cooked through, about 12 minutes. Meanwhile, melt butter in Dutch oven or large pot over medium high heat. Add remaining onion, cook until soft. Add chicken broth, hot sauce and ketchup; bring to boil, then reduce heat to medium low. Simmer until sauce thickens slightly, about 8 minutes. Add the meatballs; simmer until tender, about 8 more minutes. Mix bleu cheese and remaining sour cream in a medium bowl. Cut remaining carrots and celery stalks into sticks. Transfer meatballs to small crock pot to keep warm.Cut hot dog buns in half. 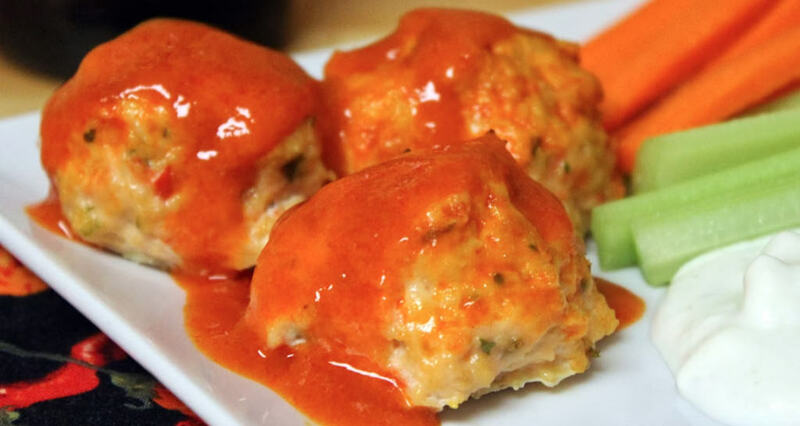 Toast lightly in oven and serve with meatballs. Oh, No! Snow! Time For Bread, Milk, And Eggs! Like most folks, I enjoy the holidays. I really do. But, by the time New Year’s comes around, I find I’m ready for a normal schedule again. Now that the holidays are over and the cold is finally really here, I’m back into our schedule and psyched for soup. 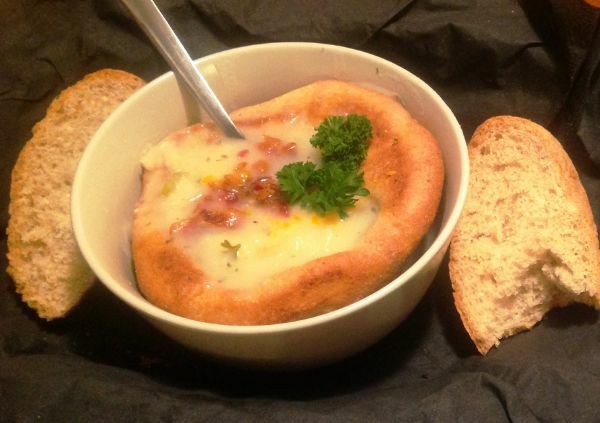 I was looking through old newsletters and came across a few versions of potato soups, one of which I converted into a clam chowder that was terrific. 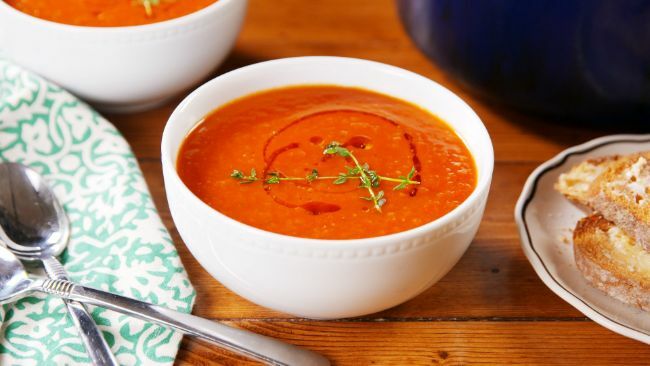 It’s always nice to have a recipe that is flexible enough that a few changes can make it into a completely different meal.Both of these soups are great in our soup bowls. I’ve been letting people know that our soup bowls are not the “melt away beneath the soup” kinds of bowls. Nope. Our bowls will allow for seconds or thirds and still be great to pull apart and eat with the soup!Meals like this don’t usually call for many sides, except whatever you might want to top the soup with. The veggies are in the soup and the bread is under it. Tada! A warm meal for a cold night with practically no cleanup and great leftovers (if there are any…).Clam Chowder5 celery stalks, diced5 carrots, diced2 medium onions, diced2 containers chicken stock7-8 small potatoesGenerous ¼ c chicken soup base6 cans baby clams with liquid1 stick butter + 2 tbsp1 c flour 4 c milkWhite pepperChop celery, carrots, onions in food processor & sauté in 1 stick butter. Add potatoes, cans of clams with liquid, 1 box chicken stock, soup base, and bring to boil until all veggies are tender.In the meantime, in separate pot, melt butter, stir in flour until it begins to clump. Pour in milk slowly while stirring vigorously. Pour in second box chicken stock. Continue stirring. Add a few ladles of soup from pot of veggies and clams. Now that roux (flour/butter/milk mixture) is hot, transfer entire contents of pot into pot of veggies and clams. Bring to boil again, then simmer and serve.To make this a loaded potato soup, rather than clam chowder, replace the baby clams with 5 strips bacon (cooked til crisp then crumbled) and 1 ½ c cubed ham. Finally, serve topped with generous amounts of shredded cheddar. Resolutions? BAH! Let Them Eat "Za"!! I’m so stuffed! After Christmas’ amazing lamb dinner, then New Year’s Eve steak dinner with sautéed mushrooms and a carmelized onion and balsamic reduction, then the traditional New Year’s Day pork and sauerkraut with garlic smashed potatoes, it feels like we’ve eaten our way through the last month. Never mind the sweets – pumpkin roll, tarts, pies… Now it’s time to get back on track.This month is traditionally the time when everyone basically stops eating. Talk to anyone in the food industry and they’ll tell you that business just tanks during January. I don’t understand. People do still need to eat, they just are focused on eating a healthier diet. That’s where we come in. Our products, being all whole-grain, are just what you should be eating. Even one of our muffins in the morning is still a better choice than white toast or a white-flour muffin or bagel. Accompany that with an egg for protein and you’ll not be snacking, even after lunch.As for dinner options, I always promote our pizza dough and crusts during this time of year. 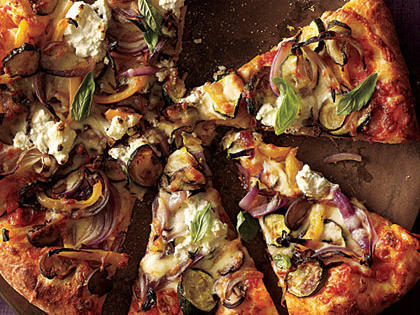 What can be better than a veggie-laden pizza made with a whole-grain (wonderfully tasty!) crust. Our frozen pizza dough makes a 12-inch, thin-crust pizza. That’s what we usually choose for home because I’m all about the crisp, thin crust. We also have pre-baked crusts for an even faster-to-the-table meal.The ideas listed below are perfect for this season because they are so packed with flavor that a little piece of the pie will go a long way. Have a big green salad with your “za” and it’s a filling, feel-good meal!Here are some great tips for making your own fabulous pizzas:Remember that “pizza” doesn’t mean “red sauce with cheese on top.” If you do use red sauce though, try getting some fresh tomatoes and crushing them, or use a can of crushed tomatoes, distribute it on the well-oiled crust, sprinkle with some oregano and kosher salt and call it done. (Traditional Italian pizza does not use pre-cooked red sauce. )A pizza is not finished until it has been drizzled with a helping of best-quality Extra Virgin Olive Oil (EVOO).For something a little different, try making your pizza in a cast iron skillet.Topping Ideas:Swiss chard, sausage (perhaps a low-fat turkey sausage available at the market! ), and fresh mozzarella (also available at the market! ): Drizzle pizza disk with EVOO, toss chard with EVOO, pull apart mozzarella and distribute around pizza, distribute chard and sausage over surface of pizza. Bake in 450-500 degree oven. You can use these directions as a guide for the pizzas below.Sautéed shitake and crimini mushrooms with Fontina cheese. Add a sprinkle of fresh arugula after it comes out of the oven and it’s a fabulous treat.Pesto, corn, goat cheese, and sundried tomatoesGrilled veggies (cut into chunks), ricotta, pecorino-romanoHam and smoked goudaSmoked salmon, spinach, and ricotta: As with above, distribute mozzarella on oiled pizza disk, top with spinach and salmon, distribute dollops of ricotta on top. Bake.Oh, and for those of you who prefer a sweeter variety, try spreading ricotta over the oiled pizza disk, top with fresh peaches or pineapple, sprinkle with a bit of cayenne and drizzle with honey. Bake until the fruits are slightly carmelized. Serve with salad dressed with a mandarin orange vinaigrette. (For the vinaigrette, try using a blood orange balsamic vinegar for a really over-the-top dressing. If you don’t have any, treat yourself to a jaunt down to Olio in Ephrata. It’s worth the trip)These are just a few ideas. Let your imagination run wild. You can top a pizza disk with almost anything. Enjoy! Last week went fast and so is this week! We've been baking up a storm and are ready for the New Year. 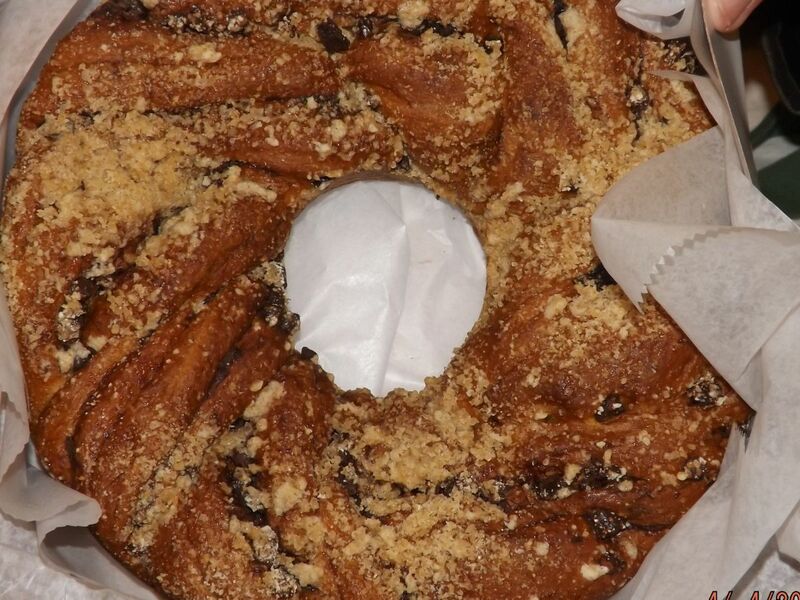 As with Christmas, we celebrate New Year's Day with a babka breakfast before heading out to the traditional pork and sauerkraut dinner with family. (What are your traditions? We would love to hear about them! )Tom and I would like to wish all of you the best in this New Year! Thank you for your support of our business and your enthusiasm for our baked goods (and our newsletter!). We appreciate you more than you could know.Blessings for the New Year and we hope to see you soon!